Wat Mahathat is a Royal Class temple of the highest order in Bangkok, located near the Grand Palace opposite Sanam Luang. 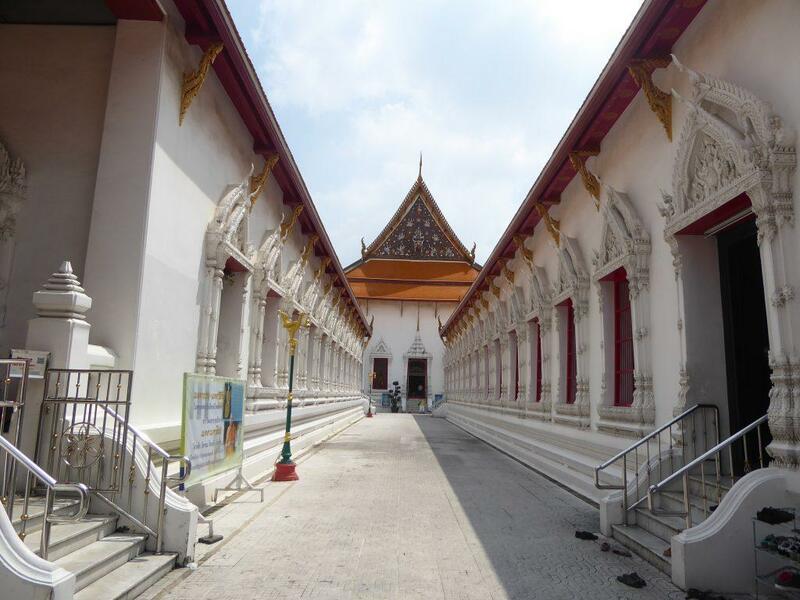 It was built during the Ayutthaya period when it was known as Wat Salak. 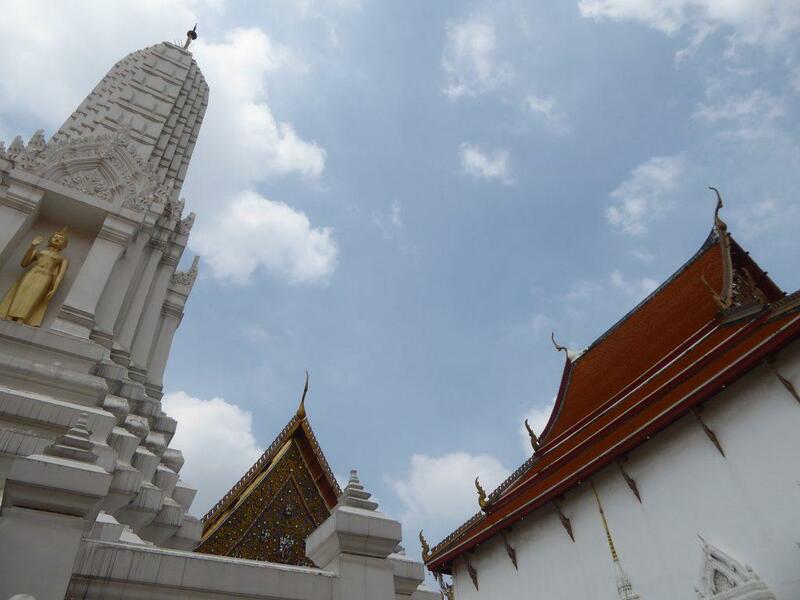 After Bangkok became the capital of Thailand and because of its position near the Grand Palace, it became a venue for royal ceremonies and funerals. The temple’s popularity with royalty has seen it elevated it in status and it was bestowed with its current name by King Rama IX in 1996. 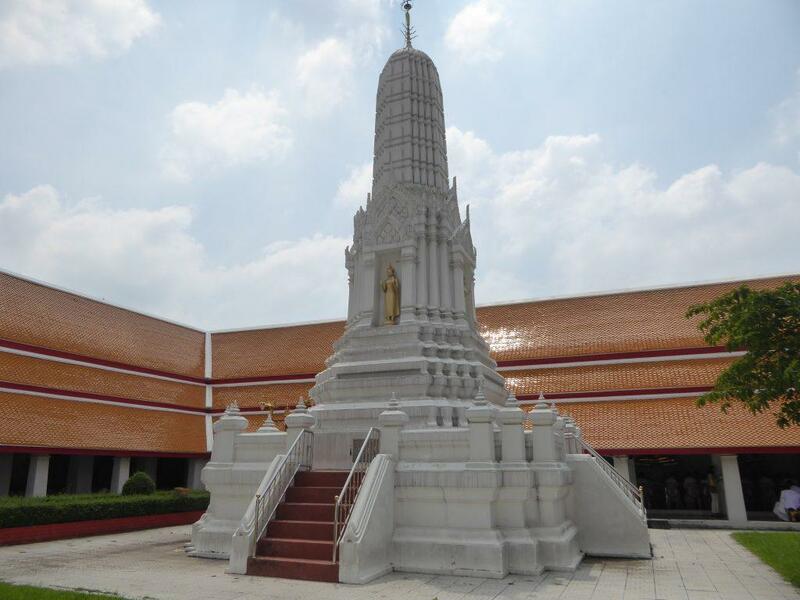 The complex also includes the Buddhist Mahachulalongkorn Vajavidyalaya University which offers English language courses in Buddhist studies and the Vipassana Meditation Center. 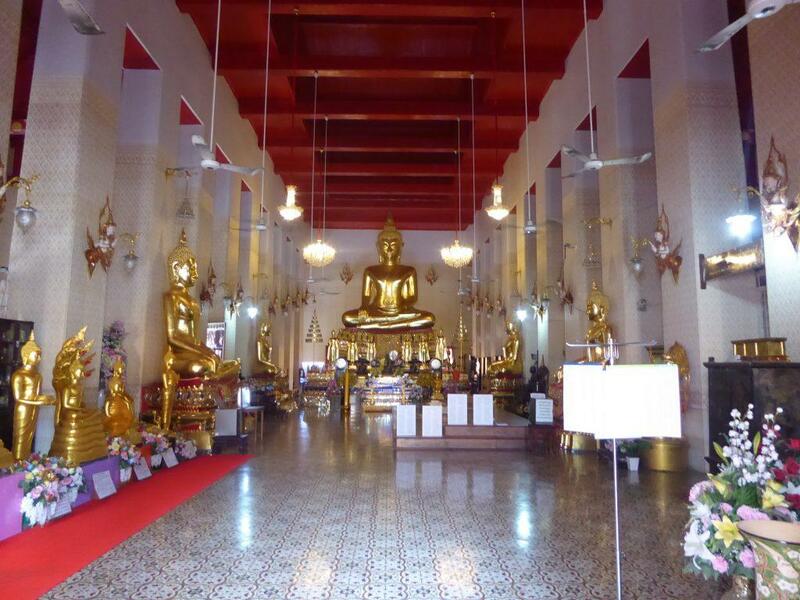 The temple has an impressive collection of Buddha images. Around the central courtyard is a gallery of Buddha images both seated and standing. 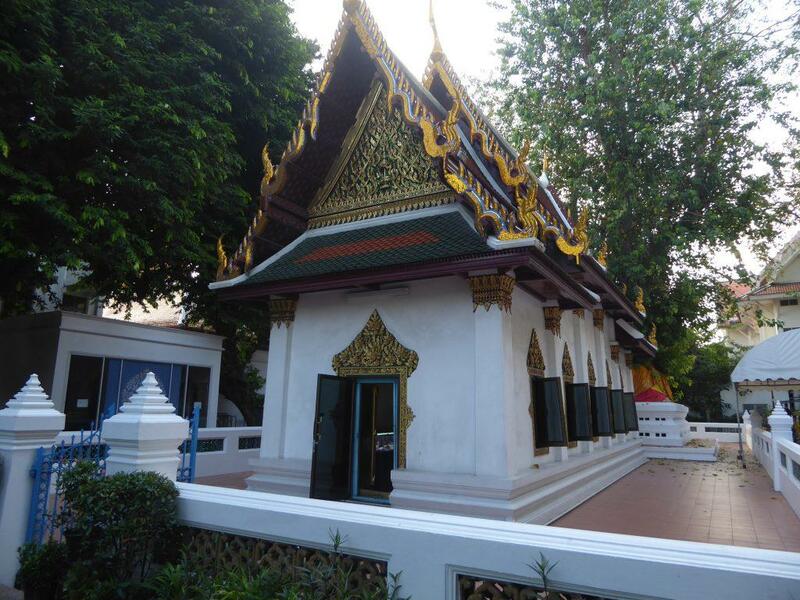 The Ordination Hall and Viharn are located side by side within the courtyard with a Mondop behind. 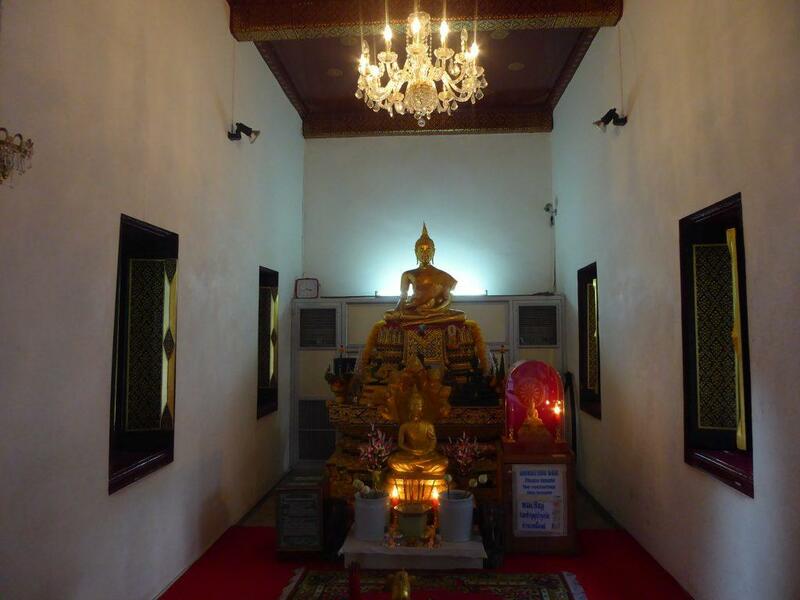 The Buddha images in the gallery have a plaque on the base dedicated to a person who is no longer alive. 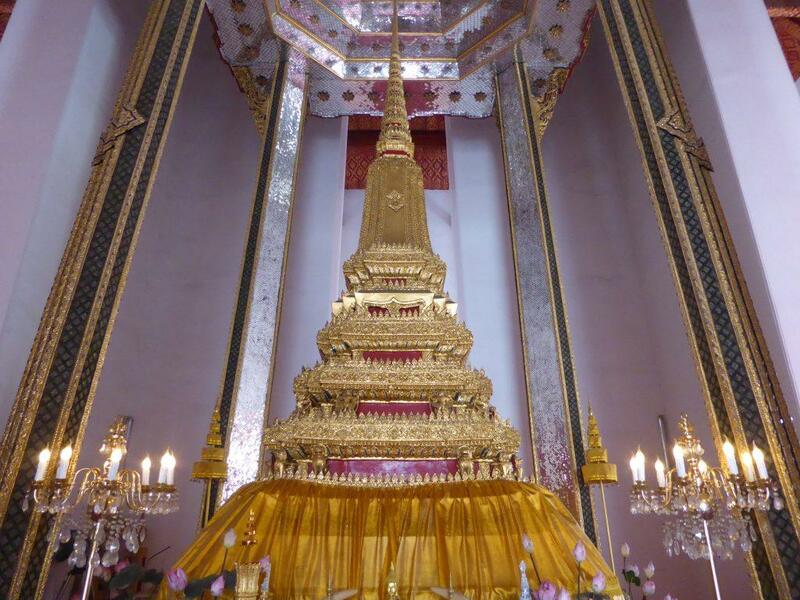 The Sacred relics of the Buddha are enshrined in the Mondop at the base of the Phra Chedi. 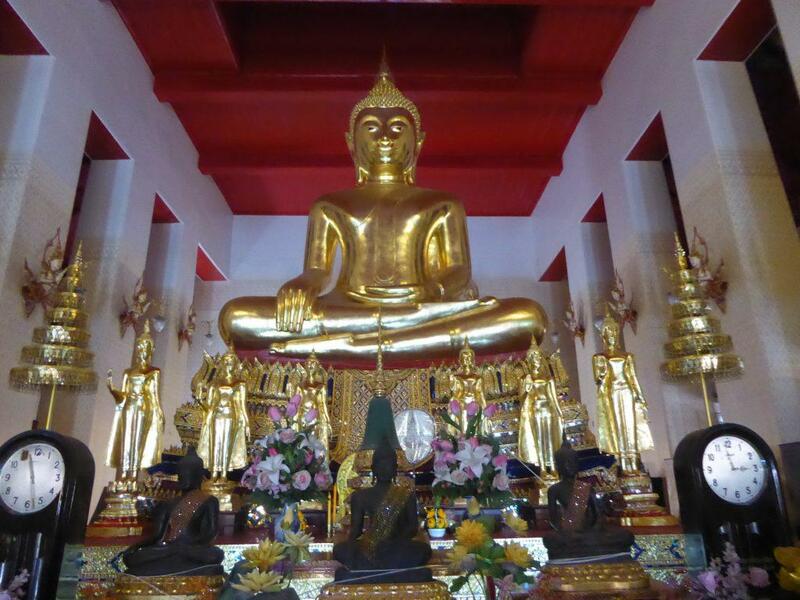 In the Vihara is a stunning collection of Buddha Images in a variety of poses. 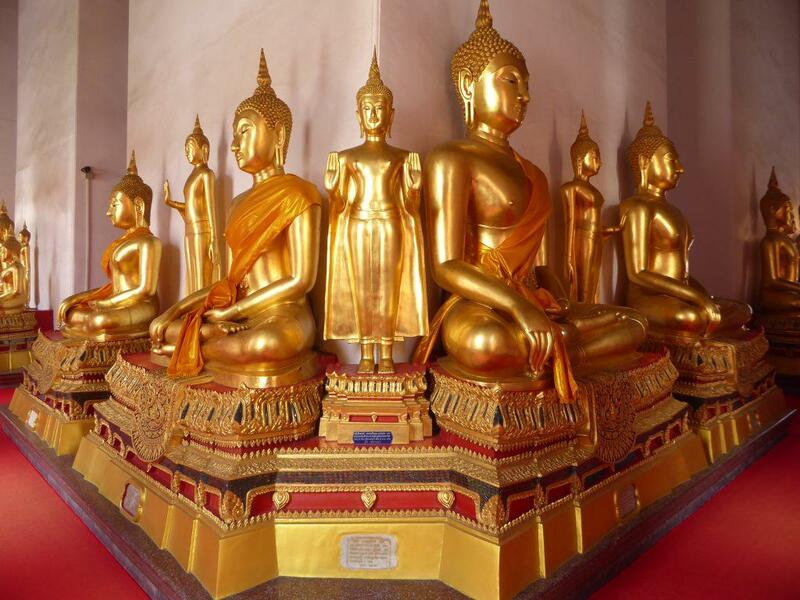 The principal image, Phra Sri Sakayamunee is seated with six smaller standing gold Buddhas and three sitting black Buddhas in front with some smaller gold images behind the base. There are two old grandfather clocks either side. 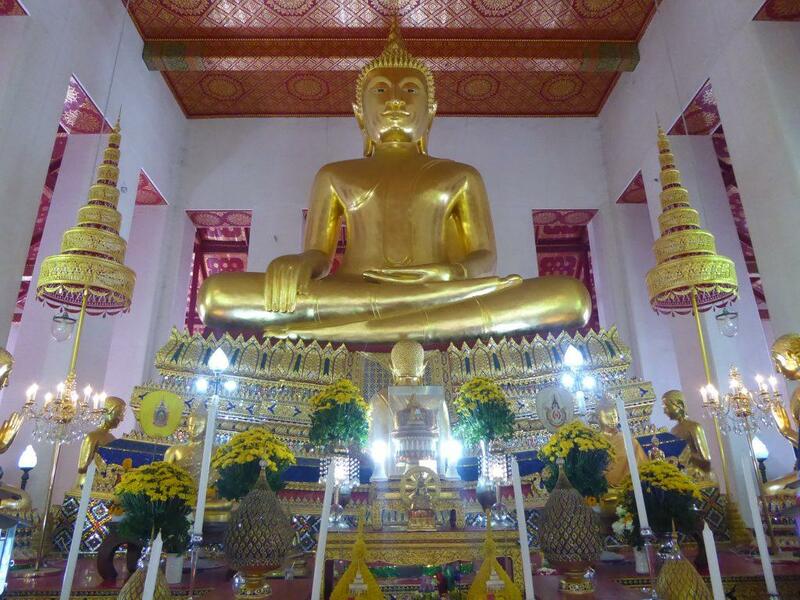 The adjacent Ordination Hall houses the principal Buddha image Phra Sri Sanpetch which is surrounded by eight praying disciples. 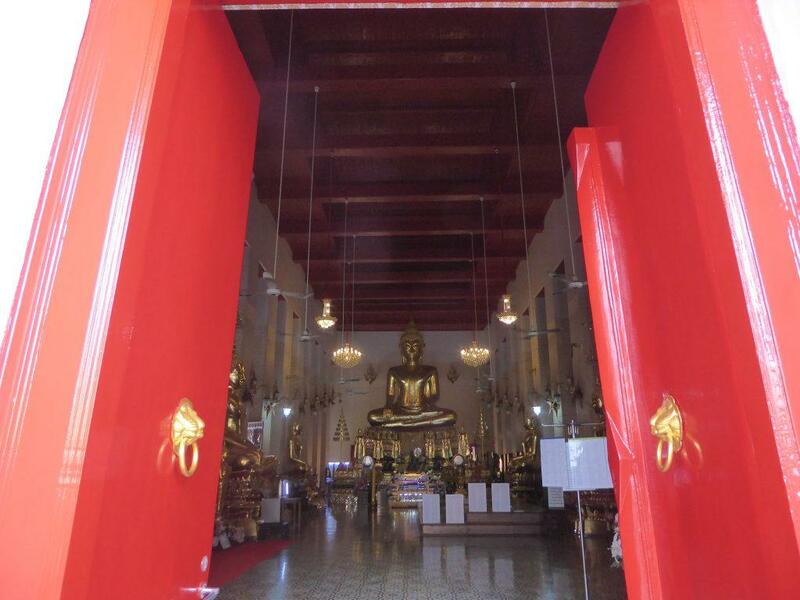 The hall is considered to be the biggest in Thailand and can hold 1000 monks. It is a typical Thai style building with carved, gilded and mirror decorated gables. In the courtyard, there is a peaceful garden with a large Khmer style prang tower. The prang has standing Buddha images in the niches. There are also a few smaller chedis. 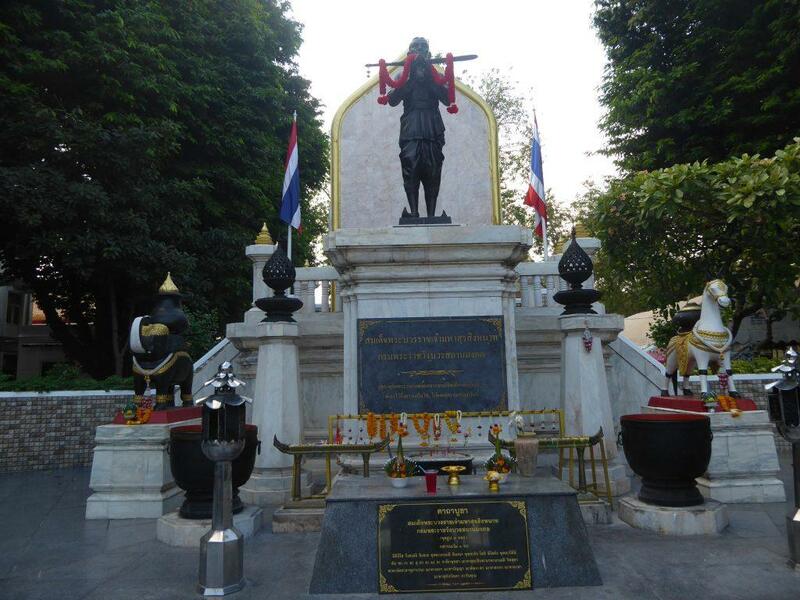 At the front of the temple opposite Sanam Luang is a statue of Prince Surasinghanart, a brother of King Rama I who carried out renovation of the temple in 1783. There is a small pavilion next door containing a Buddha image. Within the temple grounds is the Vipassana Meditation Center. There are daily meditation classes held at 07.00-10.00, 13.00-16.00 and 18.00-20.00. English speaking monks are in attendance. Neighboring the temple is a famous amulet market which is held every Sunday. Location: 3 Maharat Road, Rattanakosin, Bangkok. Getting There: Chao Phraya Express Tourist Boat to Tha Maharaj or Orange flag boat to Tha Prachan.